Artist illustration of Skylon space plane in orbit over Earth. SAN FRANCISCO — A huge, unmanned British space plane is on pace to start launching payloads into Earth orbit in less than a decade — provided it can pass a crucial engine test in June, its designers say. The Skylon space plane — which would take off and land horizontally, like a commercial jet — is still a concept vehicle for now, but it recently passed several rigorous independent design reviews, the British company Reaction Engines Ltd, which is developing the spacecraft, announced Tuesday (April 12). Private funding is lined up to see it through all stages of development, culminating with the start of commercial operations in 2020. That funding, however, is contingent on Skylon hitting some key milestones along the way, and a big one looms just a few months off. In June, the Abingdon, Oxfordshire-based Reaction Engines plans to test a component of its revolutionary hybrid jet/rocket engine. On the line is $350 million in investor funding — and perhaps the future of the project. Longstaff spoke during a presentation here at the 17th International Space Planes and Hypersonic Systems and Technologies conference, which was organized by the American Institute of Aeronautics and Astronautics. The space plane is expected to have a payload capacity of about 11.3 tons (10,275 kg), though Longstaff said future designs aim to boost that to 16.5 tons (15,000 kg). Skylon could enable relatively cheap, frequent access to space, researchers said, with each plane able to take off again within two days of landing and capable of making about 200 flights over its lifetime. 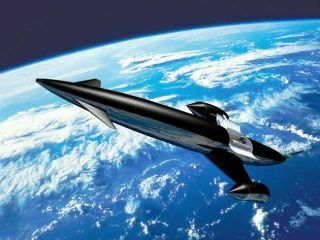 The space plane would initially fly only cargo, but over time Skylon could carry about 30 passengers with minimal modifications, company officials have said. A pressurized passenger module could be slotted into Skylon's payload bay in place of a cargo container. "Eventually, there's no reason at all it shouldn't be crewed," Longstaff told SPACE.com. Unlike NASA's space shuttle and most other space plane designs, Skylon would not require booster rockets to help it along the way. Instead, it is desiged to get to space all on its own as a single-stage-to-orbit vehicle, using a unique hybrid jet/rocket engine called SABRE, which Reaction Engines is developing. The SABRE engine will burn hydrogen and oxygen to produce thrust. It would act like a jet for the first part of Skylon's flight, breathing oxygen from atmospheric air until the plane reaches an altitude of 16 miles (26 kilometers) and a speed of Mach 5 (five times the speed of sound), Longstaff said. SABRE would then switch over to more conventional rocket operations — combusting onboard hydrogen and oxygen — to make the rest of the journey into orbit. The air-breathing phase of the SABRE engine saves greatly on the amount of liquid oxygen Skylon must carry, lowering costs substantially and giving the plane a higher payload capacity, Reaction Engines officials said. But it also imposes technical challenges, which the Skylon team must prove it can handle before the project progresses much further, they added. The atmospheric air whooshing into the SABRE engines at high speeds would be extremely hot. But for the engines to work efficiently during the air-breathing stage, that air needs to be cooled substantially — down to about minus 238 degrees Fahrenheit (minus 150 degrees Celsius) — before being compressed and reacted with the onboard hydrogen. That's what the big test in June is for. Skylon engineers have developed a new "precooler" system to do the job. The system will get its first big test in the June trials. If the precooler works, investors will chip in another $350 million, helping take the Skylon project to another level of development. That next phase would likely see vehicle design completion and a full engine demonstration by 2014, Longstaff said. Longstaff expressed confidence that the precooler would work. If it does, Skylon would leap a huge hurdle, since most of the plane relies on technology that has already been proven out. "That's the only brand-new piece of technology," Longstaff said of the precooler. If all goes well with the June test and beyond, Skylon hopes to start making suborbital test flights by 2016 and orbital test flights by 2018, said Sam Hutchison, the CEO of Skylon Enterprises Limited, which is securing funding for the Skylon project. Commercial operations could start in earnest by 2020. Hutchison — who also spoke at the conference — has mapped out funding for the various phases of Skylon's development, which he said will likely end up costing a total of about $15 billion. "We're trying to normalize the development of a space plane," Hutchison told SPACE.com. Investors are onboard and excited about Skylon's progress so far, he added. Independent design reviews by NASA and the European Space Agency, completed a few months back, were both quite positive about Skylon and its prospects, Hutchison said. He's confident Skylon will pass the technical tests ahead of it, demonstrating that the space plane is a viable vehicle. But those aren't the only hurdles in Skylon's path. The lack of a coherent regulatory framework that allows and encourages commercial activities in space could keep Skylon — and the much-anticipated private spaceflight revolution — from really taking off, Hutchison said. "What needs to be done is a redrafting of outer space law, in order to take into account commercial activities," Hutchison said. This story was provided by InnovationNewsDaily, a sister site of SPACE.com. You can follow senior writer Mike Wall on Twitter: @michaeldwall.